It is an innovative way to encourage children to read. Irish primary schoolchildren are becoming book-show presenters and are posting reviews of their favorite novels online. At the website of the FÍS book club (FÍSbookclub.ie), there are videos from schools across the country where children discuss books from the Hunger Games to Diary of a Wimpy Kid. One of the children, Matthew, talks to camera in glowing terms about the Hunger Games, telling viewers about how two characters fight each other to the death. In sixth class at Star of the Sea Boys School in Dublin, the pupils are keen to make their videos. Teacher Kevin Munnelly says: “It is a great way to motivate children to read. The lads find it fascinating. The teacher asks the pupils what they want to read, and he often orders the books from the local library. “I usually give them two or three weeks to read the book. I give them some questions to answer and they record their video. 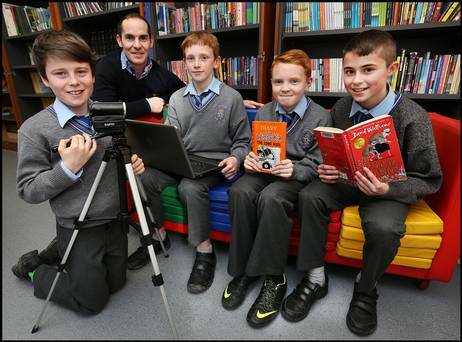 The book club is part of the Films in School (FÍS) initiative, managed by the Institute of Art Design and Technology (IADT) in Dun Laoghaire and the Department of Education's Technology in Education service. Ryan Tubridy recently launched the online book club at Lexicon, the new Dun Laoghaire library. Brianog Brady Dawson, a learning support teacher at Holy Trinity School in Leopardstown, Co Dublin, says the book club has had a positive effect. The recording of the videos is now a simple process. Typically they can be recorded on a laptop, an iPod touch, or a smartphone. Some children present their reviews straight to camera, but Brianog Brady Dawson also tries different approaches. “This not only develops a love of reading, it also encourages co-operation. They have to plan what they are going to present to camera. The FÍS book club is one of a number of initiatives supporting the national literacy strategy. Grammarians who wring their hands and allege falling standards of literacy in the age of the internet will have to think again. Test scores for reading among Irish primary school pupils are actually improving. For years there have been fears that the dominance of digital technology was damaging literacy, but the latest research shows that standards are rising. Recent research by the Educational Research Centre in Dublin shows that performance in reading is significantly higher than in 2009. There has been a drop from 35pc to 22pc in the proportion of children in second class whose reading is at the lowest level, and an increase from 35pc to 45pc in high performers. Eemer Eivers, from the Educational Research Centre, says there's been a greater concentration on literacy and numeracy in schools in recent years. She says the use of technology by children is not having a damaging effect on literacy. “If you are reading online, you are still reading, and these skills are transferable,” says Ms Eivers.